This evening's program explores the idea of cultural identities in the music of Erwin Schulhoff, Gabriela Lena Frank, and Bela Bartok. Each of these composers are, to varying extents, musical anthropologists. Frank and Bartok’s music often incorporates folk and native music styles into a western classical structure, whereas Schulhoff integrates elements of modernism, neoclassicism, jazz, and dance from a number of sources and cultures. Schulhoff’s Five Pieces, a seemingly modern take on the baroque dance suite, highlights several aspects of the composer's hybrid style: bizarre caricatures and parodies of traditional forms (Alla Valse and Alla Serenata), an homage to Czech folk music (Alla Czeca), an admiration for contemporary, popular dance (Alla Tango), and a rapid and rhythmic finale (Alla Tarantella). Frank counts composer Bela Bartok among her many influences, particularly regarding his passion for ethnomusicology. The composer’s deeply personal and idiomatic language, one rooted in the synthesis of eastern Europe folk music and Western art sources, has cemented him as one of the twentieth century's most important composers. Bartok's String Quartet No. 4 displays an enormous range of expression while concurrently reflecting his preoccupation with formal unity and coherence. 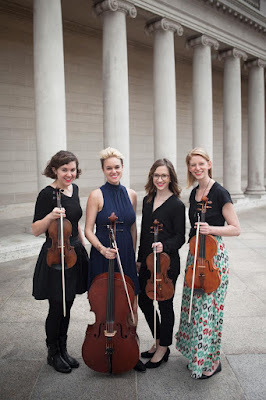 Beyond classical string quartet repertoire, Amaranth is committed to working with artists from a multitude of backgrounds and creating original compositions and arrangements for quartet. They enjoy frequent collaborations with a number of Bay Area favorites, such as Madeline Tasquin, Kendra McKinley, and Amy LaCour. Amaranth recently performed at the historic Fillmore West as part of the venue’s first all-female lineup, and has also appeared at Freight and Salvage Coffeehouse, Viracocha, and the Red Poppy Art House. They have been featured guest artists on several radio programs including KPOO, KPFA and KALX. Commissioning and premiering new music for string quartet is essential to the quartet's mission; Amaranth has performed works by emerging and established composers including Haley Shaw, Stephanie Neumann, Kenji Oh, and Brian Fitzsousa. Amaranth is actively affiliated with MusicMade Collective, a Bay-Area based organization that strives to collaborate across genres, present thoughtful musical experiences to its audience, and positively support the local and global community.